When Tom and Sarah purchased an 1870 farmhouse and barn in West Windsor, Vermont, in 2003, their farm was already famous. For example, they were told by several locals that “Good Morning, America” had once used the barn as a backdrop for one of their programs. And a 500-piece RoseArt Encore! jigsaw puzzle depicted their farm in winter with nearly frozen brook in the foreground. 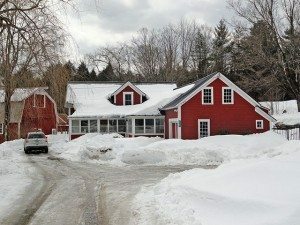 Their hearts warmed, the young couple set about learning how best to warm the house, itself, in the sometimes bitter Vermont winters, and otherwise use it most efficiently. From the outset, this was a challenge partly because of the way the house had been made – apparently without much concern for the flow of traffic, or the relative size of some of the rooms. And no attention at all was paid to “the code,” because there wasn’t any in those days. For example, what we would call the “master bedroom” wasn’t a whole lot bigger than the pantry (see the “before” diagram), with the rather inconvenient result that the new owners’ queen-sized bed took up so much of the available space that when they wanted to retire for the night, they had to wiggle their way into the room between one bedpost and the hallway door that opened into the bedroom and then only about half way. While it’s one thing to put up with such inconvenience just to get into your dream home, it’s another to live with it any longer than you must. “When we first moved into the house, we made the house livable with the help of some family and friends, and started saving what we could over the next few years, and until we had enough we brainstormed about how to improve the layout, how to make the stairs safe, how to circulate heat more efficiently in the winter, and how we would like to fix up the downstairs bathroom. It was a little like putting together a jigsaw puzzle, only the pieces were bigger,” they said. In spite of the stairs’ apparently clean record, Tom and Sarah wanted them to be safer for the sake of their kids. But after examining the space and options available, Biebel’s diagnosis was that replacing the stairs with something safer would require far more than just replacing them with another set in the same place, in which case they might qualify to be “grandfathered” in terms of the codes. “Because of the way the second floor is laid out,” he explained, “the stairs have to end up in the same place as they do now. But there’s not enough room to bring a safe straight set of stairs down the way they are now. It’s too steep, and there’s not enough space at top or bottom. 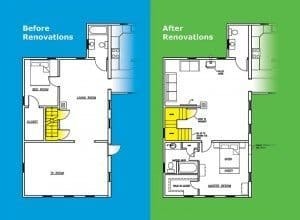 So we’re going to have to use some space from downstairs to make it work.” (See the sketch of the floor plan as it was.) How can we do that? Sarah wondered. There’s hardly room to turn around down here. So Tom and Sarah envisioned what they’d do if they were starting from scratch, and the Biebels pooled their knowledge of older northern New England construction, which enabled them to anticipate what would need to be done, and then the builders and clients compared sketches, shared ideas, and compared sketches again, until the proposed changes accomplished most of the clients’ wishes while keeping the project within their budget, too. “One of the advantages of working with us,” Paul Biebel said, “is that we can keep the entire design in house, reducing customer cost immensely. There are always changes, and changes to the changes, until everyone is satisfied, and these late amendments can kill your budget if you’re working with someone who feels obligated to charge you every time you remember even some little thing that’s still on your wish list.” Before the renovation, the house was very drafty, owing to late 1800s’ construction methods that had installed no insulation in the walls or the crawlspaces of the old cape style house. 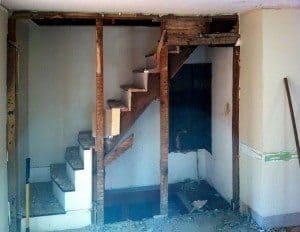 “Opening up the stairwell wall allowed us to access a few of the crawlspaces and to add some insulation to the exterior walls of the stairwell area. We chose closed cell spray foam insulation because of its air-sealing capabilities in the cavities we could access. As a result we were able to tighten the house by 14 percent,” Tim Biebel added. 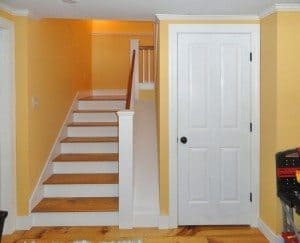 “And the staircase was transformed from an anxiety producing eyesore into a heartwarming centerpiece of a much more comfortable home.” Tom and Sarah agree. “We are so happy with how the project turned out,” they said. “The crew did an amazing job. We now have an open living space downstairs that includes a dining and family area, and a master bedroom with a full bath and walk in closet, new wide-plank Eastern Pine floors, and a house layout that flows more naturally, with the heat being distributed much more efficiently, both downstairs and upstairs,” they added.